The summer might be over, but the best of this week’s style on “Out of the Box” showcases some surprising post summer light attire with business cute and plain white chic. Plus a couple of fantastic magazine covers focusing on showrunners and a splash of animal print color to close things out. Aisha Tyler’s white mini dress (with pockets!) is jazzed up with some excellent shoe/clutch/bracelet accessories at the American Horror Story: Freak Show premiere and who cares if it is way past Labor Day; this looks amazing. Karen Gillan appeared on Jimmy Kimmel Live in something that wouldn’t look out of place on a Taylor Swift post gym sidewalk strut and her legs go for miles. It’s a super cute outfit and I especially love the gold shoulder strap detail (at first I thought she was carrying more than one bag). Short hair is still working wonders even if she’s rocking long wigged locks on Selfie. Diane Kruger joining Instagram has already given me one of my favorite photos from this week (the cat pictures she posted are also pretty wonderful) and she also unveiled her Australian Harper’s Bazaar cover shot. As they are heading into the warm season down under this Chanel ensemble is perfectly spring boho and a striking image. 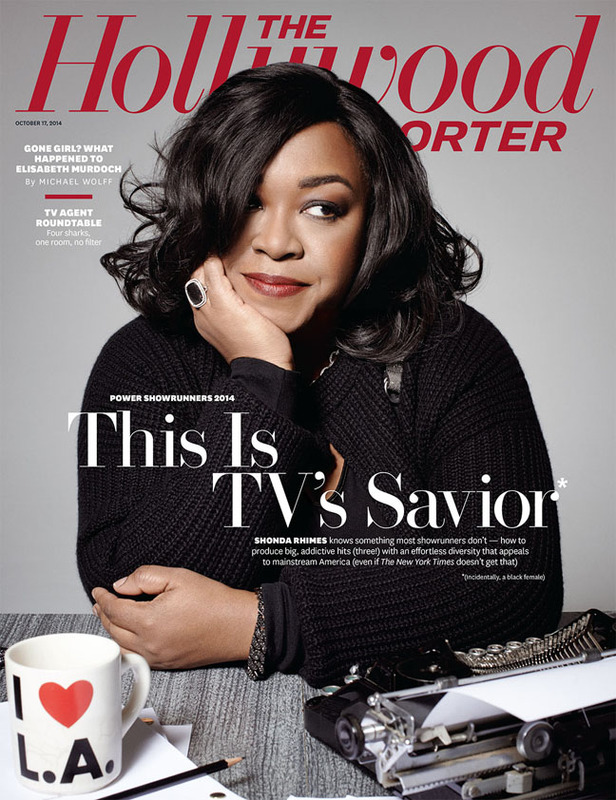 There is only one option really for who should cover the Power Showrunners issue of The Hollywood Reporter and that’s Shonda Rhimes as the Thursday night TGIT Shondaland drama block – Grey’s Anatomy, Scandal, How to Get Away with Murder – is killing it in the ratings. In the issue Rhimes discusses a whole host of things including early creative friction on Grey’s Anatomy with studio executives and the recent New York Times profile where for some reason they thought it was okay to label her an “angry black woman” and the subsequent reaction to this horrific piece. Rhimes also discusses returning to Dartmouth this summer, which in turn reveals a hint of what her Mindy Project cameo will entail. The interview is fascinating and can be read in full here. From one showrunner to another and Lena Dunham is still on her book tour for Not That Kind of Girl, plus this week she has guest edited Stylist magazine. 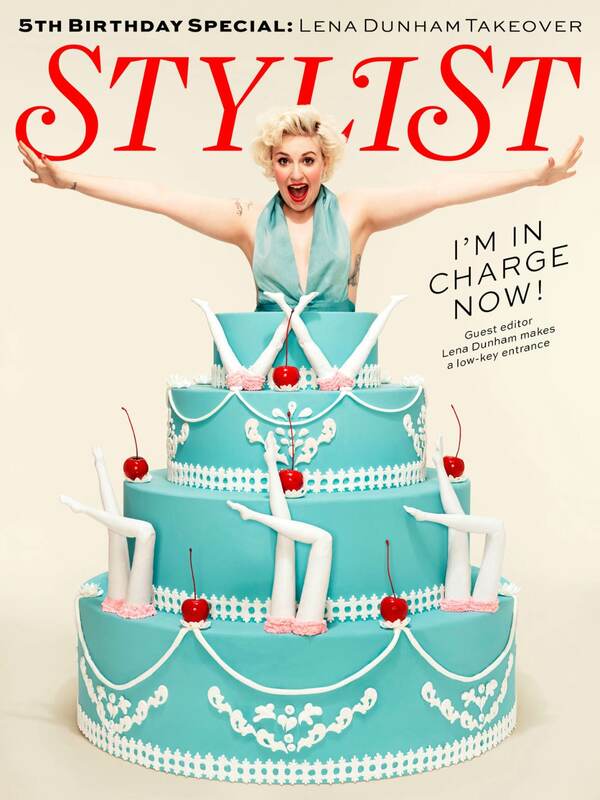 Stylist is celebrating its fifth anniversary so what better way to combine the two than Dunham leaping out of a tiered cake. The cover shot by photographer Autumn De Wilde is also a nod to Dunham’s mother Laurie Simmons as legs are a repeated image in her work. It’s a fun, playful cover and the color palette really helps the image stand out. Closing this week out with Natalie Dormer in a bold red and orange zebra print House of Holland dress at People’s One to Watch LA event. Dormer is still going for full dramatic side sweep hair as a result of her Mockingjay Cressida styling and as an “Out of the Box” regular I think we will be seeing more of Dormer on here come the huge Mockingjay promotional tour. The chunky straps on Dormer’s Jimmy Choo sandals are maybe a bit too thick for the length of this dress combined with the strong black zebra stripes, but this is a minor complaint.